A guide has been developed to help local councils take the needs of older people into account when developing new or redeveloping existing neighbourhoods. 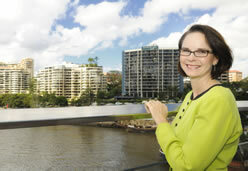 QUT School of Design Professor Laurie Buys said the guide enabled planners to better understand how their design decisions could help older people remain engaged and mobile within their communities. She said the guide was developed after research was conducted with four groups of older people in inner city and suburban Brisbane and in Toowoomba and Roma. "We found there are a lot of factors that older people take into account when deciding how confident they feel about both walking around their neighbourhood and catching public transport as opposed to driving," Professor Buys said. "We found that older people generally depend on their cars and while some of this can be put down to habit and preference, factors such as footpath maintenance, shared pedestrian/bikeways and public transport routes are also significant." Professor Buys said it had long been recognised that walking was important to the health and wellbeing of older people and research was important because it put the mobility needs of older people into a factual context that could help urban planners in their decision making. She said while there were common factors preventing older people in each of the study groups from getting out and about on foot or on public transport, including a lack of shade and public seating and limited lighting at night, there were some differences too. "In Brisbane, both inner city and suburban groups feel that because public transport generally runs into the city rather than across it, it's of little use to them when they need to go across town. "We found their community was broader than just their immediate neighbourhood and if they have to catch two or more buses to get to their destination, they're far more likely to drive. "The Brisbane City Council has a comprehensive senior strategy that addresses a range of issues including pedestrian mobility and transport. "BCC has introduced specific strategies such as kneeling buses which make it easier for older people to enter and exit as there's no stair to negotiate. This is a real positive, however, bus drivers need to ensure they park close enough to the kerb to enable easy entry and exit from the vehicle." She said key factors that planners for the inner city could take into account included shared pedestrian/cyclist pathways, poorly maintained footpaths, and dangerous pedestrian crossings. "Factors to consider in suburban Brisbane include offering suburb to suburb public transport routes which avoid the city centre, with consideration into the placement of stops recognising the difficulty for older adults to walk up and down steep hills." Professor Buys said older people in Toowoomba found a lack of availability of public transport services to be a key concern. Local buses were the only form of public transport available with the participants highlighting issues with timetabling and distances to bus stops making driving more appealing. "They also said the only mode of public transportation was a limited taxi service with long wait times making it difficult for them to access their communities without driving." The research involved 48 older residents who kept daily travel diaries, were tracked using GPS and GIS technology over the seven-day research period and participated in follow-up in-depth interviews. Professor Buys said Australia's ageing population meant the needs of older people would be best dealt with sooner rather than later. Professor Buys said the research was an Australian Research Council (ARC) Linkage Project, The neglected dimension of community liveability: Impact on social connectedness and active ageing. Professor Laurie Buys says the design decisions of planners can either help or hinder an older person's ability to be mobile within their community.